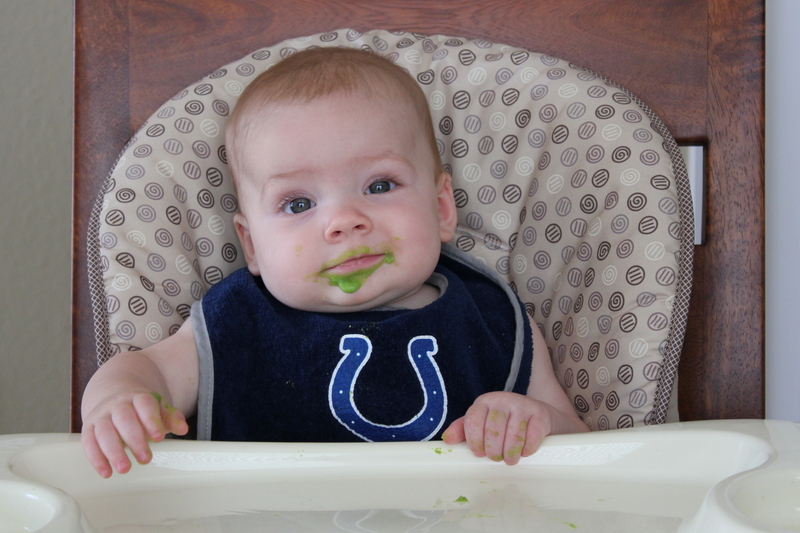 I’m not sure why, but I wasn’t really looking forward to the introduction of solids. While it’s exciting, it’s also more work. It’s so easy to feed her now. We’ve developed a good schedule with her feedings and I didn’t really want to deter from that. And let’s be honest, it’s a whole new ballgame in the world of cloth diapering. our decision to puree our own food, which made me even more nervous that I wasn’t going to do it right. 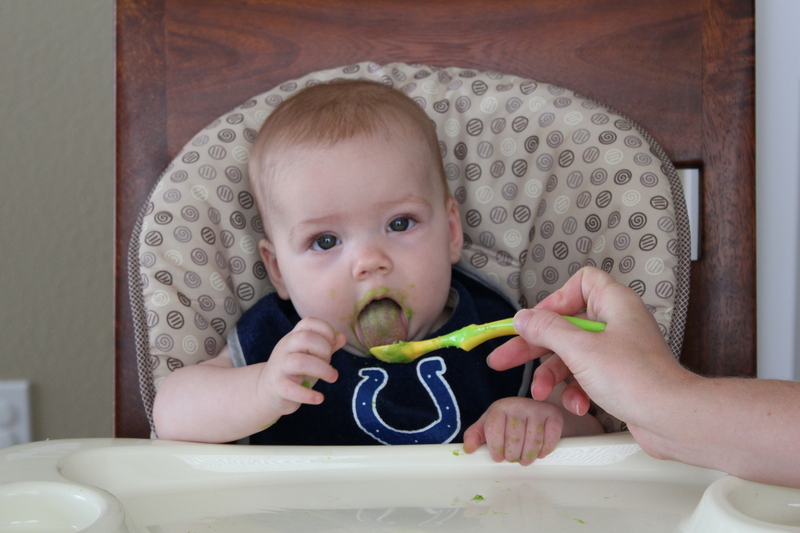 but we were approaching the tail end of the 4-6 month starting point for solids, so we did it. Again with the over-analyzing, the next decision was what her first food was going to be. Alas, we decided on organic peas. They were super easy to cook, thanks to our Baby Bullet. I’m sticking with our original decision to puree foods for her, especially after I now know how easy it is. Here is her first bite! After seeing how interested she was in the spoon, I think she’ll want to feed herself some. On her last couple of bites, I think the taste finally hits her. 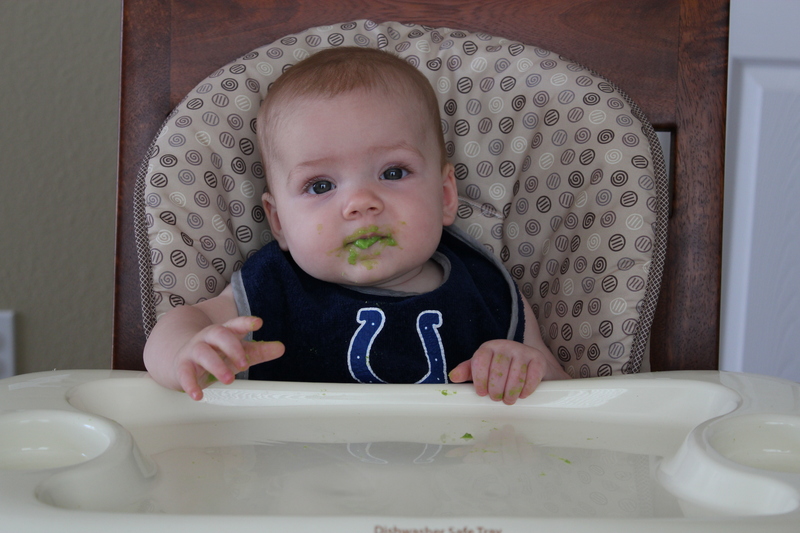 She did very well with her first serving of peas, better than I thought. She’s had one serving of peas each day at school this week too and has done fairly well. I am still nervous about how it’s all going to go, but feeling better than I did. When do we move up to a second daily feeding? And then a third? When will she start needing less breastmilk? What should we feed her next? My goal is to continue feeding her only organic fruits and veggies. At this point, for us, there just really is not reason not to. I have zucchini, squash, and white sweet potatoes all ready to be pureed! So there you have it. We conquered our first food! 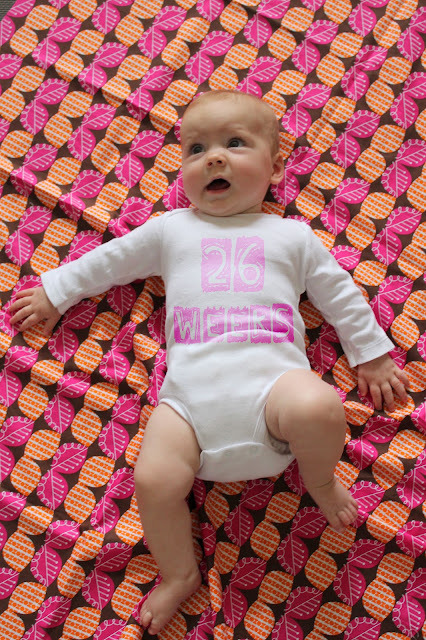 And little miss is half a year old! 26 weeks today and six months tomorrow. I’m not sure how that’s possible. Stay tuned for another update tomorrow. This is a great resource for introducing solids and also has great recipes for babies and toddlers! I used this all the time with Charlie!